But what about the sound of good bread making? 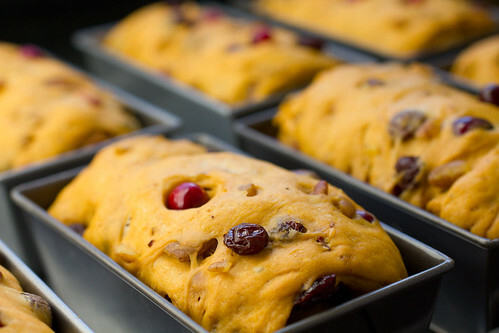 Yes, the sound, at least when it comes to these yeasted cranberry-pecan pumpkin loaves. The boing, boing, boing of fresh cranberries bouncing, just like Tigger. While trying to stuff as many of these crimson beauties into the dough as possible, some inevitably ended up on my kitchen floor. Oops! Cranberries bounce, hence their nickname “bounceberries”. Who knew? According to legend, a grower in the 1880′s named John “Peg Leg” Webb did. He had only one leg and couldn’t carry his cranberry harvest down from the storage loft in his barn. So instead he poured them down the steps. He noticed that only the freshest, firmest fruit reached the bottom. Rotten or bruised berries remained on the steps. This discovery led to the invention of cranberry bounce boards, which are still used today to help growers separate the bouncing fresh berries from the bounceless rotten ones. OK, so cranberries have hops, but why? Small pockets of air inside the fruit allow them to bounce. Cranberries can hop and also pop. 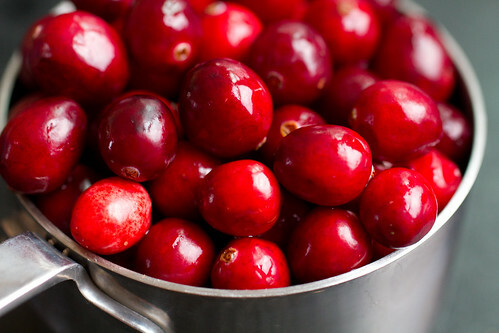 The popping noises heard when making cranberry sauce are the air pockets heating, expanding, and bursting. These same air pockets allow the berries to float on top of water, which makes harvesting easier. Most of our country’s cranberry crop is wet harvested. This means the bogs are flooded with water and the berries, which have risen to the top, are scooped up. Sure, getting the berries wet means they won’t keep long. But these cranberries are destined for juicing, canning, or drying, so shelf life isn’t an issue. However, it is for the fresh cranberries in the 12-ounce plastic bags currently lining the grocery store shelves. These berries are dry harvested or picked right off the vine. By keeping the bogs dry, the berries stay fresher longer, although several berries from my last bag beg to differ. While bouncing may be what Tiggers do best, cranberries have other talents. Not only do they hop and pop, boing and bounce, but they also bake up beautifully, almost like jewels, in this bread. 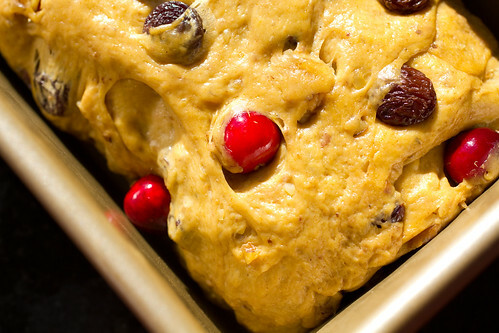 When I hear cranberry-pecan pumpkin bread, I immediately think of the standard baking powdered raised quick bread. This one’s different. It’s a yeasted fall mosaic that’s definitely not quick. Although it uses a straight dough method (no sponge or starter), it needs an overnight rest in the chill chest to do just that – chill to develop the most flavor and texture. Is it worth it? I think so, and so does my youngest daughter, who, when asked by her preschool teacher what she was thankful for, answered this bread. makes 3 small (5¾ x 3¼ x 2″) loaves or 2 medium (8×4″) loaves. 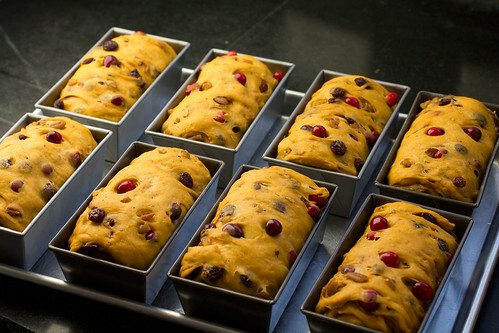 To make 8 mini loaves as pictured, double the recipe but use 2¼ teaspoons yeast and 2 tablespoons plus 1 teaspoon water. With Sullivan’s recipes, I find I have to do very little tweaking. I swapped pecans for walnuts, upped the amount of cranberries (which may explain why they ended up on the floor), and added the weights. Mixing and Kneading: Whisk the flour, cinnamon, nutmeg, and salt together in a large bowl; set aside. Pour the water into a small bowl, sprinkle in the yeast, and whisk to blend. Allow the yeast to rest until it’s creamy, about 5 minutes. In a stand mixer fitted with the paddle, beat the butter and sugar at medium speed until creamy. Add the pumpkin and egg and beat until blended. The mixture will appear curdled but will smooth out when you add the dry ingredients. Reduce the mixing speed to low and add the yeast. Then begin to gradually add the dry ingredients, about ½ cup at a time. As soon as the dough begins to come together, scrape the paddle clean and switch to the dough hook. If your dough does not come together (perhaps your pumpkin puree was liquidy), add a little more flour. With the machine on low speed, add the pecans and raisins, mixing only until incorporated, about 1 minute. Add the cranberries and mix as little as possible to avoid crushing them. I find this easiest to do with my hands. 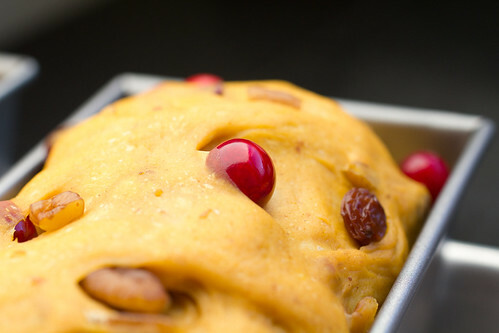 Inevitably some cranberries will pop and stain the dough red. Smile and carry on. First Rise: Scrape the dough into a lightly buttered large bowl, cover tightly with plastic wrap and let rise at room temperature until nearly doubled, about 2 hours. Chilling the Dough: When the dough has doubled, fold it over on itself a couple of times to deflate it, wrap it tightly in plastic and refrigerate overnight. Shaping the Dough: At least 6 hours before you want to begin baking, remove the dough from the chill chest. Leave the dough, covered in its bowl, until it reaches at least 64°F on an instant read thermometer. (This will take as long as 3 or 4 hours – be patient.) If you don’t have an instant read thermometer, look for the dough to be slightly cool and just a little spongy. Lightly butter three 5¾ x 3¼ x 2″ loaf pans (or your choice of pan). Working on a lightly floured surface, divide the dough into thirds and pat each piece of dough into a 5 x 7″ rectangle; keep a short end facing you. Starting at the top of each rectangle, roll the dough toward you and seal the seam by pressing it with your fingertips. Seal the ends, then place each roll, seam side down, in a prepared pan. Second Rise: Cover the pans lightly with a kitchen towel and allow to rise at room temperature for 1½ – 2 hours, or until the dough has nearly doubled and risen just above the rims of the pans. Baking the bread: Center a rack in the oven and preheat to 350°F. Bake the loaves for about 35-45 minutes, or until deeply golden and the bread registers 190°F. You may want to shield the loaves lightly with foil during the last 20 minutes to prevent overbrowning of the crust. Remove the pans to a cooling rack and let rest for 5 minutes. Then turn the breads out of their pans and allow them to cool to room temperature on the rack. Storing: The breads can be kept at room temperature for a day or two or frozen, wrapped airtight, for up to a month. Thaw, still wrapped, at room temperature. Note: If using fresh pumpkin or butternut squash, split the squash, remove the seeds, and place, cut side down, on a baking sheet. Roast in a preheated 350°F oven for about an hour, or until meltingly tender. Scoop the softened pulp out of the shell and cool completely. One pound of squash yields about 12 ounces of cooked pulp. 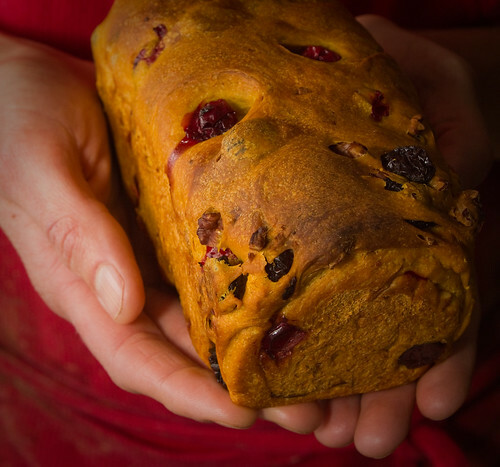 9 Responses to "Yeasted Cranberry-Pecan Pumpkin Loaves"
Thanks for the lesson Jenn! I would be happy to try some, wink, wink! These look marvelous. And its a technique not unlike my pizza dough recipe. Cold-fermenting is really worth it and gives a nice seasoned, developed taste. I’m going to try these! These look so perfect and delicious! Kind of looks like panetone! Simply amazing! I love the color! Those mini loaves are gorgeous! Bravo! Jenn, would you allow me to copy the last picture on that post and share it, with a link toward your post and recipe attached, on my blog Votrepain.com, the way I do with various blogs and sites I like in my weekly bread posts? Your pictures and that recipe are just great. Jenn (who is nearby) says that you’re welcome to it. And thanks so much for the kind words! Thanks to you, and I really love those pics!